It is the final week of August. What happened? I hope you have some fantastic Labor Day weekend plans, and if you follow those fashion rules, I hope you wear all of your white before next Monday. And that is just what we are talking about today. Little white dresses. Grab these for Labor Day weekend party and you will shine. Such a beautiful dress. Textured and eye catching in all white. Something classic and preppy? And under $60! Try to beat this sale price. I dare you. Such a statement dress with the flutter torso details. And now for something casual and effortless. 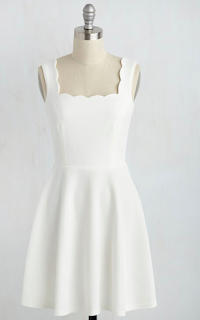 Whether you follow the no white after Labor Day rule or not, anyone can enjoy a simple LWD. These options are easy on the wallet and perfect for the end of summer.